The 2019 Women's National Championship Game is set. After Baylor outlasted Oregon in the first game, the defending champions Notre Dame took down UConn, 81-76 to get back to the title game for the second straight season. It wasn't exactly the prettiest game, as the two teams combined for 87 misses, and shot just 15-of-48 from downtown. But it was absolutely competitive. In the 50th meeting between coaches Muffet McGraw and Geno Auriemma, and eighth in the Final Four, the two old Big East rivals traded bucket for bucket over much of the game, which featured over two dozen lead changes. In the final few minutes though, Notre Dame pulled away, overcoming a nine-point deficit in the fourth quarter. Arike Ogunbowale led all scorers with 23 points, while Jess Shepard added 20 points, 13 rebounds and seven assists for Notre Dame. On UConn's side, Katie Lou Samuelson put up 20 points, while Napheesa Collier had 19. Katie Lou Samuelson and Arike Ogunbowale are two of the best offensive players in the country, but they didn't play like it in the first half. UConn's senior forward took just five shots in the first 20 minutes, and missed all of them. Meanwhile, Ogunbowale put up just six attempts, making one of them. For players who averaged 18.5 and 21.5 points, respectively, that obviously wasn't good enough -- especially on this stage. In the second half, however, the two stars showed why they were both All-Americans this season. Sameulson went off in the third quarter pouring in 15 points in that frame alone to help the Huskies take a lead into the fourth. In the end, she finished with 20 points, all of which came in the second half. They weren't enough, however, because on the other side, Ogunbowale was just as good down the stretch. Last year's Final Four hero came up clutch again, going for 21 second-half points of her own, including 12 in the fourth quarter to help seal her squad's trip back to the title game. When they have Jackie Young and Arike Ogunbowale, it makes sense that most of the attention for Notre Dame focuses on their electric backcourt, and certainly they were key on Friday night -- especially Ogunbowale. But the Fighting Irish have gotten to this point because they have a complete team, and their frontcourt stepped up in a major way against UConn. Jess Shepard was one of the only players who could buy a bucket early on, and her strong play in the first half was the main reason Notre Dame wasn't in a big hole early. By the time the final buzzer sounded, the senior had registered 20 points, 13 rebounds and seven assists in one of her best performances of the season. On the other block, Brianna Turner found redemption. Unable to play last season when Notre Dame won the title due to an ACL tear, Turner stepped up to make sure she has a chance to earn another trophy. She went for 15 points and 15 rebounds, but more importantly played some fantastic defense, blocking five shots along the way. No one had an easy time scoring on Friday night, but the Fighting Irish got themselves all sorts of extra looks at the basket thanks to their relentless activity on the offensive glass. Defensive rebounding had been an issue for UConn throughout the tournament, as they allowed a whopping 77 offensive rebounds in their first four games -- a number that would understandably seem like a misprint at first glance. 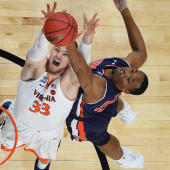 Unfortunately for UConn, it was not, and the Irish continued that trend by grabbing 22 offensive rebounds of their own. Shepard (seven) and Turner (six) combined for 13 offensive boards, two more than UConn's entire team. Notre Dame turned those extra opportunities into 14 second-chance points, which was a huge boost to their struggling offense. On a single possession in the fourth quarter, the Irish grabbed five offensive rebounds, before Ogunbowale hit a huge 3-pointer. As the Huskies found out, it's tough to win when you continually give a great team extra chances to score.